Hi everyone. 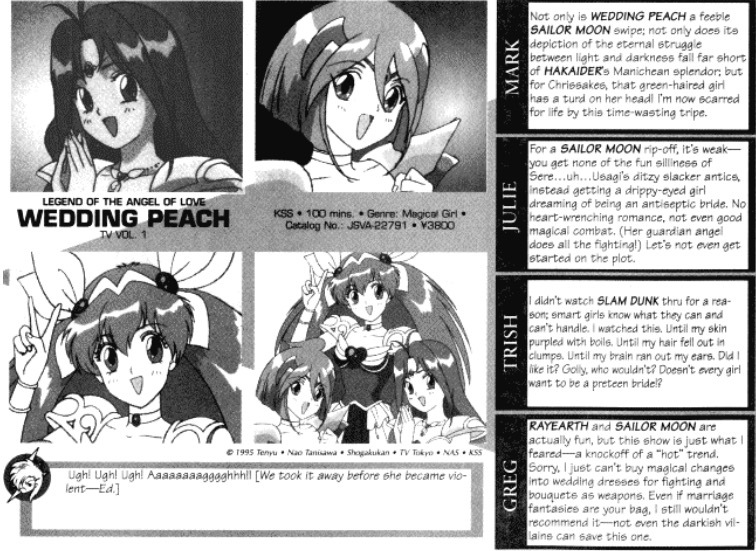 I just want to have a discussion about the Wedding Peach Animerica article and yes I know that this article is from the 90s, but I want to talk about it though. When I read this article, it makes me very angry since I am a huge Wedding Peach fan and I feel like Animerica criticized Wedding Peach way too far without really giving the series a chance, plus they even spelled Ms. Nao Yazawa's last name wrong because instead of writing Yazawa they wrote Tanisawa which is really dumb of them. By the way Nao Yazawa is the creator of Wedding Peach and I wrote this just case if anybody doesn't know. I know that a lot of Wedding Peach fans feel like this article really ruined Wedding Peach's reputation in the West and I have to agree because if Animerica didn't write this article, then Wedding Peach would have been popular in the West and have the same popularity as Sailor Moon. Anyway everybody what do you think about this article? Do you think Animerica is being too harsh on Wedding Peach? or that they shouldn't write the article in the first place? I would love to read what all of you have to say about this and I will post the picture of the article for everyone to see. You can read more about the article on the TechnoGirls Wedding Peach website and I will provide the link to it too.